Pictured here is the oldest existing bottle of Icewine made in North America. The bottle label was hand done by Tilman's Mother, and yes, the bottle still contains Icewine. It was sent as a gift to Tilman's Aunt in Germany. His Aunt had the foresight to send it back to Tilman because she thought it was too valuable to drink. It is part of Tilman's private cellar, along with some other amazing items. We thank Tilman Hainle and Sara Norman for the right to use this picture. The numbering 429 and 431 out of 456 Bottles, hand penned in black ink. “ On the morning of November 22 nd 1982 at -13 degrees C. Okanagan Riesling grapes were picked from our own vineyards in Peachland to make 200 litres of this naturally sweet wine. It has a slight sherry character, a rich fruity aroma and tastes unlike any other wine. 34 % sugar at harvest. 10 % sugar, 11.9 g/l acid at bottling. It has been said that winemaking is the world's second oldest profession. Perhaps the secrets of wine making are older than recorded history, which first mentions wines around the year 1500 BC, starting in Mesopotamia or Caucasia. By the year 3000 BC wine making had spread to Greece and to Italy by 1000 BC. The Greeks called Italy the Land of the Vines. The Vikings landed in what is now called Newfoundland, calling this new land Vineland. Chateau d'Yquem from France is one of the most prized dessert wines in the world. Château d'Yquem is a Premier Cru Supérieur French, "Great First Growth" or "Great First Vintage") wine from the Sauternes region in the southern part of Bordeaux. Its history can be traced back to 1711; long before Germany made icewine. The prohibitive price made it available only to royalty. Château d'Yquem was the drink of royalty. Few could afford the price. It was not until the development of icewine was there a wine that equaled or surpassed the status of Château d'Yquem . That was not until the 1980s when noted wine writers compared the two and declared in flavour of icewine. Simply stated, it had a fresher taste. Dr. Hans Georg Ambrosi is called the father of Eiswein by many of his peers. From 1967 until 1990 he was the director of the Rheingau State Domaine, one of the world's greatest wine estates. * He first began experimenting with Eiswein wines in 1955 while at school in South Africa, where traditions and laws regulating wine production did not restrict him. Ambrois returned to Germany where he was appointed director of the Rheingau State Domaine. He found another winemaker who had also produced icewine; thus began Germany's production of icewine on a regular bases. While Germany is recognized by most of the world as the home of Icewine, they ironically cannot produce the wine every year. Whereas, Canadian icewine makers can and do. Canadian winemakers "fine tuned" the art, and today Canada is the worldwide leader as an icewine producer. The first Icewine to appear on the Canadian front was a Riesling, made in British Columbia by Walter Hainle and his son Tilman in 1973. 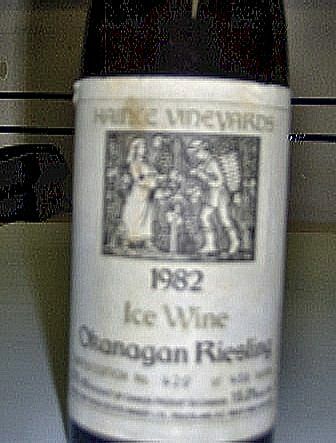 Tilman Hainle and and his wife Sandra continued experimenting with Icewines at their Hainle Vineyards in the Okanagan, ultimately producing their first commercial release in 1978. In 1991, other Okanagan winemakers joined in, capitalizing on the early onset of cold temperatures that year and plenty of frozen grapes on the vine. Mr. Hainle was born in Germany and immigrated to Canada in 1970, he established his winery in 1988 and offered for sale his 1978 vintage icewine. The winery is located in the small community of Peachland in British Columbia's Okanagan. For almost twenty years, only two wineries made icewine on a regular basis: Hainle in the Okanagan and St. Laszlo in the Similkameen Valley. Despite having been first produced in British Columbia, it was in Ontario that the Icewine industry began to flourish. In 1982, Peter Gamble, a young winemaker from Hillebrand Estates (started in 1979 as Newark wines) tried to make icewine for his personal use, but an unfortunate accident spoiled the experiment. A year later, icewine caught the attention of Donald Ziraldo, the co-founder of Inniskillin Wines, and Karl Kaiser, his winemaker and business partner. They set aside a few rows of Vidal for late harvesting. Ewald Reif of Reif Winery and Walter Strehn of Pelee Island Winery also agreed to set aside grapes just for icewine. also joining them was Hillebrand winery under Dr. Joseph Pohorly and the above mentioned Peter Gamble. Dr. Joseph Pohorly was one of the first winery owners in Niagara. He founded Newark Winery in the Village of Virgil in 1979, one of the three original cottage wineries that opened in Niagara in the '70s and laid the foundation for the growth of the new Ontario wine industry. Joseph himself was no stranger to wines. Born in Vineland, Ontario, he began life as a farmer's son and learned how to grow grapes and other fruit crops from an early age, gaining an appreciation and knowledge of the land, of our geography and climate, and of the unique characteristics that make this viticultural area special. In 1983, Joseph made the first Icewine for Hillebrand and, in the process, became of the early Canadian Icewine pioneers. By the following year, almost every winery in Niagara was leaving grapes hanging on the vines to create the luscious nectar that would become the darling of the industry. In 1983, Karl Kaiser made a mistake. He didn't net the grapes left hanging past autumn harvest – grape intended for the winter Icewine production. That winter was early and cold and the birds were hungry. And early one morning, when the air was chilling and the ground snow-covered, there wasn't much for the birds or animals to forage. The grapes became a meal for wildlife. And the Icewine crop was lost. The same was true of Reif winery They two failed to harvest and produce a Icewine in 83. This left only Hillebrand and Pelee Island who both claim to have bottled and sold icewine. Here we also find a mjor differnce Hillebrand harvest then froze the grapes Pelee Island although nature to free the grapes then harvest. 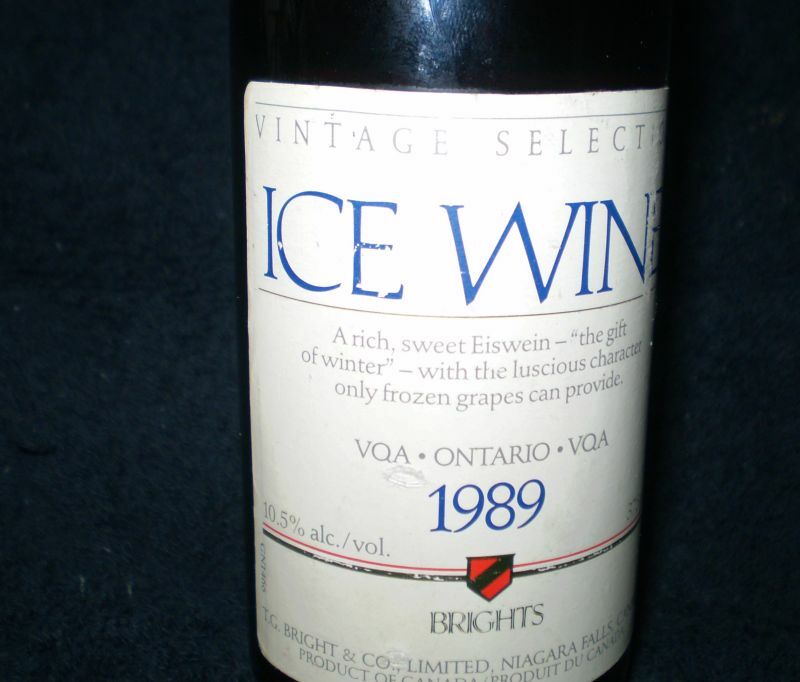 Brights' first commercial release labeled Eiswein was the 1986 vintage, in 1987 the name was changed to Icewine. Although their first attempts were not successful, but by adding nets the following year, Inniskillin leaped to the forefront of an historic beginning for the wines of Canada. Persistence paid off! Today, Inniskillin Wines is a world leader in the production and sales of Icewine. In a June 1991 fair at Vinexpo, Bordeaux, the greatest of international accolades for Canadian Icewine was bestowed on Inniskillin's 1989 Icewine. This wine, judged by an international panel, was accorded the fair's highest award, Le Grand Prix d'Honneur. In 1975, John Paroschya, a young wine scientist, was sent to Germany by Brights to earn his doctorate. Part of his program had him picking frozen grapes for Eiswein. John concluded that the Canadian winters were more favourable for producing icewine than Germany's. Upon returning to Canada, he experimented with Vidal grapes. After Paroschya moved on to Chateau des Charmes in 1982, Ray Cornal continued his work at Brights. They made Vidal Icewine in 1983 and 1984, selling it under the label of Brights Research Cellars, sold only at the Niagara Falls retail store. Ontario Icewine strikes gold at Vinexpo in Bordeaux, France. 1991. 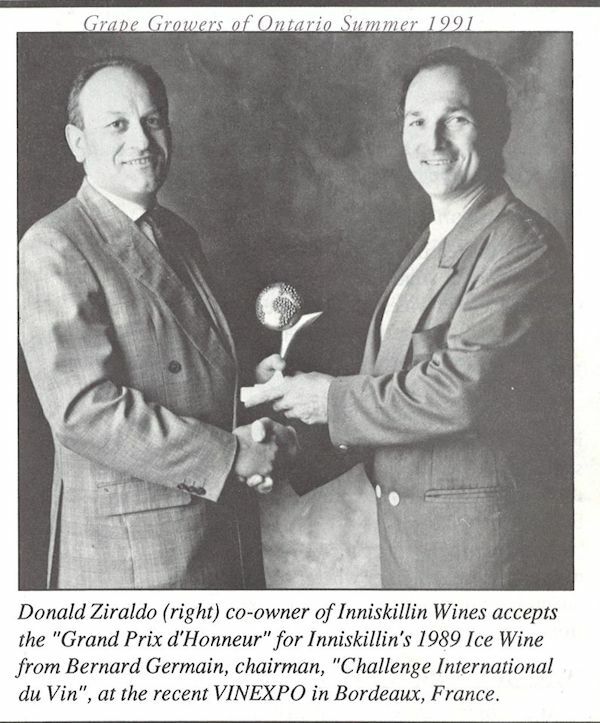 Donald Ziraldo and Karl Kaiser played a major role in the development and success of Canada's icewines. Other wineries also took the plunge, including Walter Schmoranz, wine master and president of Pelee Island. His 2002 Cabernet Franc Icewine was winner of the Citadelle de France Gold Medal. Royal de Maria exclusively produces Icewine from a number of vitis vinifera varieties including Riesling, Chardonnay, Pinot Blanc, Pinot Noir, Cabernet Franc and Merlot. Pillitteri Estate, which holds the title as the world's largest estate producer of icewine, is currently the first winery in the world to commercially produce a Shiraz Icewine. St. Laszlo Vineyards Estate Winery Joe Ritlop may have produced an icewine in the 70's but he never promoted it for commercial use. Back in BC, winemakers like Howard Soon (Calona Vineyards), Sandra Oldfield (Tinhorn Creek) and Paradise Ranch, who specialize in making only icewines, led the way. Nova Scotia, with fewer wineries than BC and Ontario, is also becoming a noted producer of Icewine. Jost Vineyards as been producing Nova Scotia Icewine since 1985. Jost Vineyards' 1999 Vidal Icewine was declared Canada's Wine of the Year at the All-Canadian Wine Championships held in Ontario. This is the first time in the 20 year history of the championships that a Nova Scotia winery has won this prestigious award. We may have missed some winemakers and wineries who have greatly contributed to the production of Icewine in Canada, but the story has not ended. From time to time www.winesofcanada.com will add to the history of Icewine in Canada. We have not mentioned the Icewines of Quebec, nor have we mentioned fruit wines. There are also the International award-winning Royal DeMaria Wines. Their contributions are making Canadian Icewines famous around the globe. Royal DeMaria makes 12 varieties. 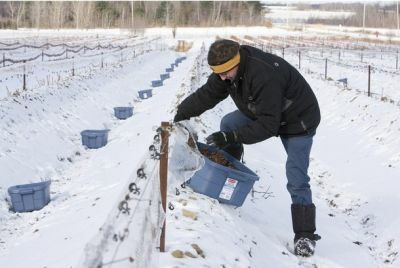 In Quebec, Chapelle Sainte Agnès in Sutton planted vineyards in 1997, comprised of riesling, vidal, gewürztraminer and other grapes, precisely to focus on Icewine. Icewines can be made from a variety of grapes. Riesling is the the premier variety for making Icewine. Vidal is a hardy grape and very popular in Ontario. Gewürztraminer, Pinot Noir, Pinot Gris, Cabernet Franc, Chardonnay, Gamay, Merlot and Kerner are all used in making Canadian Icewines. Is it Icewine or ice wine? It really does not matter. In Canada the term most often used is Icewine (we have standardized the word's capitalization), where in Europe those writing in English use ice wine. Year after year, Canada's wineries are awarded gold medals throughout the world for their quality Icewines. Year after year, Canada's winemakers strive to produce better wines, challenging themselves and each other to produce this liquid gold. We would like to thank author John Schreiner for his continuous contributions to this website. * We have contact most of the wineries involved in the early winemaking history. Some responded some did not. The research continues. In 1999 Pillitteri Estates was the first producer to create a successful Merlot Icewine. In 2004, they created the world's first Shiraz Icewine, followed in 2007, the world's first Sangiovese Icewine and in 2008, first sparkling Cabernet Icewine. Today Pillitteri Estate Winery produces over 13 different styles of Icewine, far more than any other winery in the world. They are considered to be the world's largest producer of Icewine. ** From Wikipedia, the free encyclopedia. - Katherine Reid winemaker Joseph Estate. - John Schriener - wine author.